Hey everyone! Can you believe that it's January already? Wow, where did this past year go? Hopefully you were able to document many, many layouts last year and are all ready to start documenting this year's events. Make sure you check out January's new challenges and speed scrap schedule for great inspiration to get you scrapping in the new year. 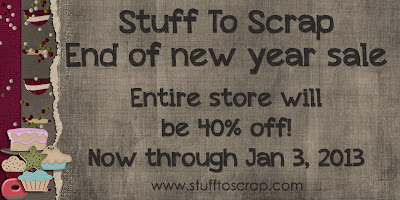 Looking for some new goodies to help with all of that scrapping this year? 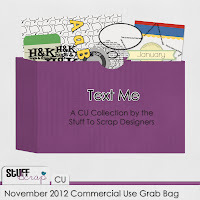 The designers at Stuff to Scrap are ready to help you with that! In fact we're kicking off the new year with a End of the Year sale that lasts through January 3rd! Our whole store is 40% off, so make sure to head on over and get yourself some goodies. And check out the quick page set made by our fabulous designers. These 20 amazing quick pages will help you scrap those memories in a snap! Looking for more goodies? Make sure to check out the beautiful Build-A-Kit pieces this month. Instead of a single theme this month, the designers went with monotone kits. Each designer picked their own colors and made a beautiful kit. With all the variety, there's something for everyone in this month's BAK selection! 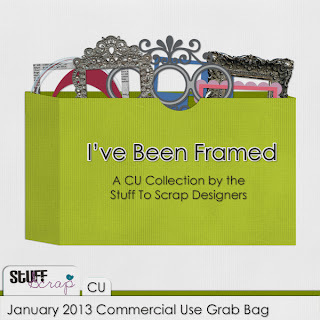 Don't forget about our monthly designer Commercial Use Grab Bag, I've Been Framed! Yep, you guessed it - this month the theme is frames. Not a designer? No problem! This is a great way to add some fabulous frames to your stash whether you are a designer or not. This set includes extracted frames, ready-to-use frames (some with shadows), layered frame templates, and more! And make sure to grab the November Mega Collab, Autumn Smiles and the matching Autumn Smiles Quick Pages, and the November Commercial Use Grab Bag, Text me, before they're gone next month! Also, make sure to check out the fantastic January Road Trip, Cocoa and Coffee. Designers and forum users alike have come together to make an amazing road trip for you to follow. Make sure to check the Stuff to Scrap blog for a full list of participants. Thanks for reading and we hope that you have a wonderful start to this new year!